Travel around the United States, try to woo voters across the country, create your own political agenda, skillfully manage your campaign budget... and perhaps you will be the next White House occupant! 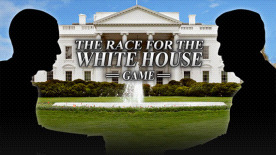 A presidential election simulation game with realistic elements for political neophytes and serious political junkies! Continuously appraise statistics and poll results on participating candidates on the game's ￼￼￼website!